Ephemeral Monument is a performance-video installation project created in response to the archives of the library of the Iranian Students Association of Northern California, active from 1964-1984, soon to be part of the collections at the Library of Congress and Stanford University Library. 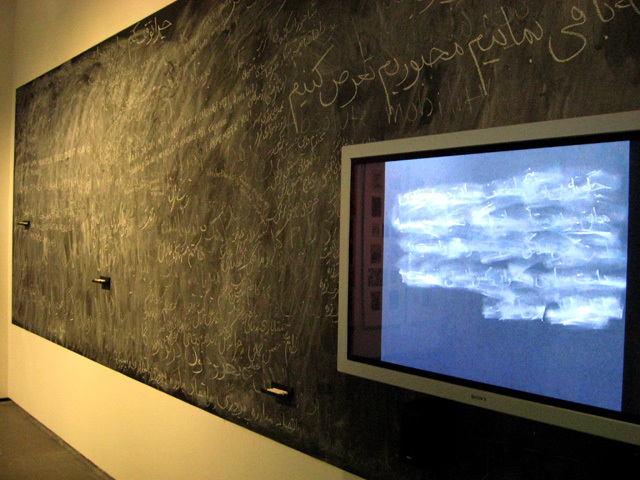 In this piece I write in chalk, erase and re-write selections from a few of the archival texts that emerged from and influenced the political, the poetic and the personal dimensions of the opposition to the Pahlavi Monarchy and the formation of emancipatory ideas, rhetorics and actions amongst two generations of students, intellectuals and activists in Iran in the years leading to the 1979 Revolution. Here I use the material and embodied processes of writing, erasing and re-writing to construct a ritual through which I can re-inhabit and reflect upon a past which is as intimately mine as it is of significance nationally, regionally and globally. Writing in chalk is a return to my first public medium as a writer, a calligrapher and an agitator; a high school student who stole rare unobserved moments to write provocative messages on her classroom's chalkboard and who took her writing to the city walls during the protests of 1978-79. My engagement in present time with these formative texts of the past is an act of remembrance and homage to the collectivity that I was a small part of, and at once a narrative of forced and voluntary departures from that collectivity. What remains of this engagement, the documentation, is only a trace of the impact of transversing the historical axis that connects those years to this moment. The performance takes place and is recorded over 3 days at Yerba Buena Center for the Arts as part of Theory of Survival, curated by Taraneh Hemami for Bay Area Now 5 - Inside/Outside. The recording is played back on a monitor installed on the wall on which the final writing remains for the duration of the exhibition, before it is painted over and disappears from view. There is a dedication section on the wall where gallery visitors are invited to write comments and dedications. Documentation of the performance will be donated to the institutions holding the original archives to comment upon the inadequacy of archives as records of lived experience. Having burned my own archives of formal and informal documents and ephemera when the post-revolutionary government of Islamic Republic staged the massive and systematic arrests and executions, coercion and silencing of its oppositional forces, it is my hope that some day this archive-in-exile will be openly accessible in Iran; to remember, to revisit and to reconcile.